In 1990, the world, including Canada, signed the Convention on the Rights of the Child, making a promise to children to protect and promote their rights to survive and thrive, to learn and grow, to make their voices heard and to reach their full potential.¹ To view the Convention on the Rights of the Child, please click here. In May 2016, the Minister of Indigenous and Northern Affairs announced Canada was now a full supporter, without qualification, of the declaration.2 To view the full declaration, click here. 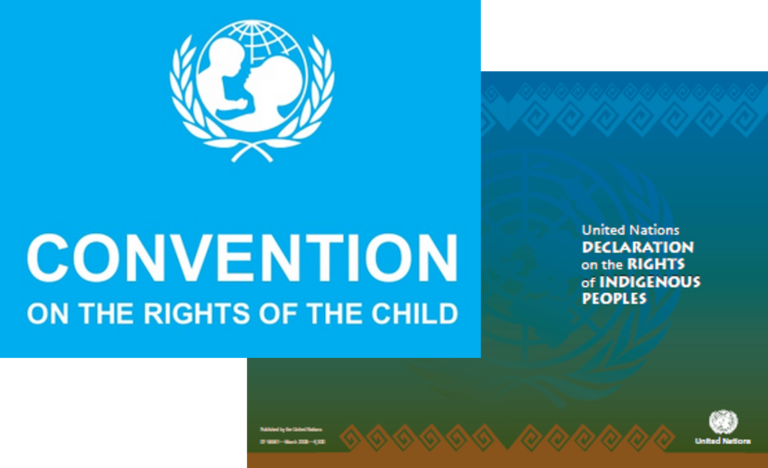 Together the Convention on the Rights of the Child and the United Declaration on the Rights of Indigenous People outline important rights that governments have committed to in order to protect children, their environments and their families. To help Indigenous youth understand the rights outlined in the UN Declaration on the Rights of Indigenous People and what they mean for them, Know Your Rights was developed. To view this resource, please click here. 1United Nations Human Rights Office of the High Commissioner. (1989). Convention on the Rights of the Child – accessed November 14, 2018. 2Indigenous and Northern Affairs Canada. (2017). United Nations Declaration on the Rights of Indigenous Peoples – accessed November 14, 2018.